Check out this recently released resource on how to get started with building Enterprise IoT applications. 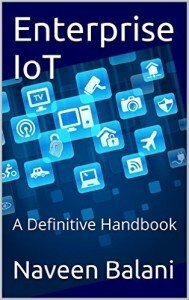 Over the last few m onths, we have been working round the clock to release the first edition of our book, Enterprise IoT – A Definitive Handbook. This is our first book which provides details on how to build IoT applications using commercial IoT cloud services and open source technologies. A detail overview of key components of Internet of Things and the most comprehensive view of an Enterprise IoT stack. How to apply IoT in context of real world applications by covering detailed use cases on manufacturing, automotive and home automation. Understand the technical strategy and how to implement IoT applications using Microsoft, IBM and Amazon IoT offerings and various open source technologies and map it to our Enterprise IoT stack. We even updated our book prior to release to accommodate the latest and greatest IoT offerings, including the Amazon AWS IoT (released on 8th October 2015) and Microsoft IoT Suite (released on 29th September 2015). We believe the concepts and content laid down in the book would be a useful resource to build any IoT application and be a part of your IoT journey. For more details, visit http://enterpriseiotbook.com/.